The last time I remember using 300-ohm twin-lead transmission cable for a television antenna is about 20 years ago when I lived in a fairly rural area and had a VHF/UHF aerial mounted on a 20-foot tower with a rotator. Since then the connections have always been 75-ohm coax either to wired cable or a satellite dish (now I have nothing). I do, however still have 300-ohm twin-lead running from my ½-wave dipole antenna that is used for FM radio reception. Most people more than 40 years old remember seeing the old twin lead running down across the house roof, down the side, and through the living room wall. My guess is that little consideration was given to cable routing and how it might affect the performance of the cable. Twin-lead cable is amazingly low loss - typically much lower than coaxial cable - when properly suspended. Its weakness is its vulnerability having its impedance altered by nearby structures. Coaxial cable largely solves the proximity problem because in an ideal coaxial cable, all the RF current flows on the outer surface of the center conductor and on the inner surface of the outer shield. Author Mark Nelson conducted a simple experiment to determine how twin-lead cable routing affects line loss. Impressively, twin-lead cable is fairly tolerant of non-ideal routing as long as it remains dry and does not lie close to ground. Catalogues usually give the characteristics of 300-ohm transmission lines in free space. These figures will change considerably when used in actual installations. Almost every TV antenna in the country uses 300-ohm twin-lead for the transmission line. These transmission lines are installed with procedures that time and experience have shown to be best. Other than experience, however, what do we really know about 300-ohm lines? What effect do water, metal, or close proximity to wood or the earth itself have on 300-ohm transmission lines? The only published figure the author found stated that the 300-ohm flat transmission line has a loss of 1.7 db per 100 feet at 200 mc. (Ch. 11 = 198-204 mc.). Taken quite literally, this means that a 200-mc. 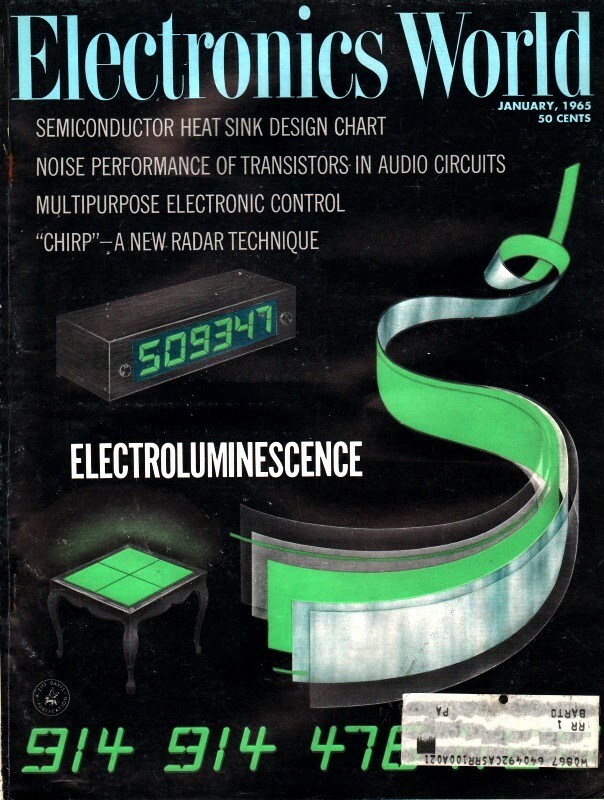 signal would travel through 353 feet of 300-ohm twin-lead before losing 6 db, or 1/2 of its original voltage. This is quite an achievement for such a low-cost transmission line. For all practical purposes, though, this figure is useless because it is a computed, free-space loss that is not valid in actual practice. 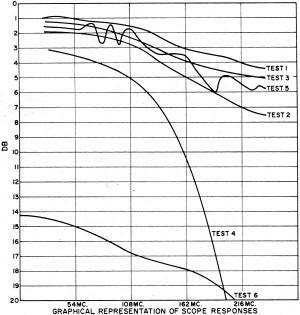 Lacking any further information, it was decided to find out exactly how good 300-ohm twin-lead is and the extent to which various practices affect its transmission qualities. Fig. 1. Test setup for determining the characteristics of typical 300-ohm transmission line under various conditions. Sweep generator "H" output drives scope horizontal circuit. The loss of the line at different frequencies, and under different conditions, is determined by adjusting the variable attenuator until the detected outputs of path A and B are equal as observed on the scope. Using the test setup shown, a group of tests was made to determine loss vs frequency. The 300-ohm transmission line used in these tests was 100 feet of Belden No. 8225. Test 1. 100 feet of twin-lead was routed along a wooden wall, simulating a normal installation with 3 1/2" screw insulators every ten feet. Test 2. 50 feet of twin-lead was supported with insulators and 50 feet of twin-lead was stapled with Romex staples across the line. Staples were placed five feet apart. Test 3. 100 feet of twin-lead supported by wooden blocks was placed just above ground level. Distance above ground was three feet at wooden supports and two feet at mid-span between blocks. Test 4. 100 feet of twin-lead was lying on the ground. Test 5. 100 feet of twin-lead was installed as in Test 1 with the twin-lead running through a three-foot section of aluminum weather stripping. Test 6. 20 feet of twin-lead was soaked in water for two hours. The results were multiplied by five to obtain the figures for 100 feet of line. Fig. 2. 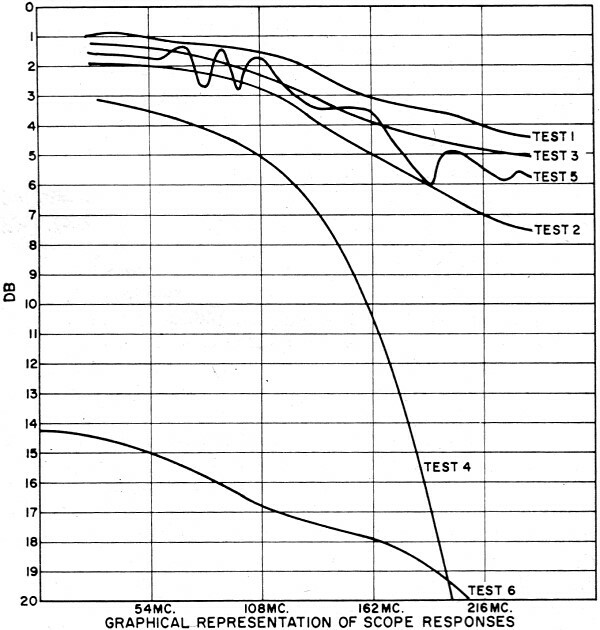 Results of six tests made on typical 300-ohm twin-lead.